By Dr. Mae-Wan Ho and Prof. Peter Saunders in universities and open forums in Luzon and Mindanao 11-16 December 2005. The precautionary principle is really just a statement that we shouldn’t introduce a new technology or continue with an old one unless we’re convinced it’s safe both for us and for the environment. If we’re not sure, we wait until we are. We don’t just charge ahead and hope for the best. and show how the principle could and should be applied in the cases of Bovine Somatotropin (currently before the WTO) and GMOs. When an activity raises threats of harm to human health or the environment, precautionary measures should be taken even if some cause and effect relationships are not fully established scientifically. In this context the proponent of an activity, rather than the public, should bear the burden of proof. Now you might think that this was such an obviously sensible idea that no one could possibly disagree. Unfortunately, there are many who do. That’s usually because they or the people who support them want to make profits out of things that might be very dangerous: for instance, asbestos, tobacco and GMOs. They insist on what we might call the anti-precautionary principle: what they are producing must be permitted unless and until it can be proven to be dangerous. What is more, they set a very high standard of proof: the tobacco companies are still advertising and selling cigarettes despite the overwhelming evidence that smoking, even passive smoking, contributes to many serious diseases, not only lung cancer, and significantly shortens life expectancy. Because these people represent big corporations, well-financed think tanks, and university departments, they have a lot of influence. So we can’t assume that just because the precautionary principle is common sense our governments are going to adopt it. We’re going to have to convince them, and to do that we have to be clear in our own minds about what it is and how it works. The precautionary principle is like the legal principle of the burden of proof. In a criminal court, the two sides are not on equal terms. The defendant doesn’t have to prove he is innocent. He doesn’t have to prove anything. The prosecution must prove he is guilty “beyond reasonable doubt.” If they cannot, he goes free. The reason for this deliberate bias is that while we hope that our courts will convict the guilty and acquit the innocent, they won’t always get it right, and we have to think about what will happen then. Most people would agree that while it is bad that a crime should go unpunished, it is much worse that an innocent person should be convicted. So just thinking that someone is probably guilty isn’t good enough. The jury may only convict if they are really convinced he is, beyond reasonable doubt. In exactly the same way, the precautionary principle says that if we have good scientific grounds for being concerned that something presents a serious danger to health or the environment, then we do not have to prove that it is dangerous before we can justify banning it. It is the people who want to use and profit from the technology that have to prove it is safe. Of course they don’t have to provide absolute proof – there are no absolutes in science any more than in the courtroom – but they have to demonstrate safety beyond reasonable doubt. And we bias the decision in that direction because the damage that can be done if a technology turns out to be unsafe can be so much greater than what we stand to lose by waiting until we are sure it is safe, or can be made so. Opponents of the precautionary principle have a number of standard objections that they generally raise when attacking it. They are all easily refuted, and I’m not even sure if the people that put them forward really believe them, but it’s as well to go through the ones that are most often used. 1. “The precautionary principle is useless because it does not lead to decisions.” The principle is not a formula for making decisions. Decisions are made by people exercising their judgement, and the precautionary principle is just one of the things they should take into account. A judge will explain the concept of the burden of proof to the jury, but they still have to decide whether the defendant is guilty beyond reasonable doubt, and even what level of doubt they are prepared to accept as reasonable. In the same way, even if we accept the precautionary principle, we must still weigh up the evidence as best we can and decide for ourselves. 2. “The precautionary principle does nothing that is not already covered by risk assessment.” Risk assessment involves multiplying the probability that something happens by the cost if it does. The precautionary principle comes into play when we are not able to estimate one or both of these factors at all, or with any degree of accuracy. 3. “The precautionary principle is too weak. It would make no difference at all to policy.” I shall show later how using the precautionary principle would have made a major difference to policy on asbestos (as it would have on many other issues) and would make a difference now if applied to BST and GMOs. 5. “The precautionary principle is anti-scientific.” Nothing could be further from the truth. The precautionary principle applies only when there are good scientific grounds for concern. It then requires that more good science be done to address those concerns. What is anti-scientific is to assure the public that something is safe when you have no evidence to back up your claim. 6. “The precautionary principle is merely a cover for protectionism.” Anything that involves regulation can be used to block imports. Here, however, the innovator has the opportunity to have the ban lifted by providing convincing scientific evidence that what he wants to export is safe. 7. “These issues should be decided in the courts.” The precautionary principle is not an alternative to the courts; like the burden of proof it is a principle that the courts can and should use. I’ll now discuss three examples. The first illustrates clearly what can happen when the precautionary principle is not used; the other two are current issues where using the principle would make a real difference. Everyone knows that asbestos is very dangerous and that it is still being removed from buildings some of which are no more than 30 years old. Most people probably believe that the danger was only recently discovered and that action was taken as soon as it was. Actually it wasn’t quite like that . Asbestos was first mined in Canada in 1879. It was soon noticed that people who worked with asbestos tended to suffer from respiratory diseases, and in 1898 an English factory inspector, Lucy Deane, observed that these were more serious than what she saw in other workers who worked in dusty conditions. She was also able to discover why: asbestos fibres are sharp and so likely to damage the lungs. Nothing was done about her report, and even in 1917, when more evidence had accumulated, the UK Factory Department decided that there was no need to take any action. In the very next year, however, insurance companies in the USA and Canada started to refuse cover to asbestos workers, “due to the assumed injurious conditions in the industry”. Note the parallel with GMOs today. We are being assured by the biotech industry and by our governments that GMOs are safe, yet at the same time the industry is refusing to accept any liability if they are not, and insurance companies are refusing to provide cover. A clear example of what happens when, as the Americans say, you ask someone to put his money where his mouth is. For most of the rest of the twentieth century, the evidence against asbestos steadily built up. It became clear that not only people who worked with asbestos but also their families and others who came in contact with it were at risk. Yet far too little was done, and then only in the factories. It wasn’t until 1982 that the British government started to restrict the use of asbestos and look for alternatives, and only in 1998, the one hundredth anniversary of Lucy Deane’s report, was asbestos banned altogether in the UK and France. Even then, the Canadian government went to the World Trade Organisation to have the ban declared an artificial restraint of free trade. The WTO rejected the appeal – it is hard to see how even the WTO could have done anything else in view of the overwhelming evidence – but this is a very clear example of how an industry can put profit ahead of safety and how a government can support it. Throughout the whole of the twentieth century, governments consistently took an anti-precautionary approach to asbestos. They waited for undeniable evidence of harm before taking any action, which meant they always acted far too late. What would have happened if they had applied the precautionary principle? We don’t know, because we can’t say when they would have banned asbestos or at least regulated its production and use. That would have been a matter of judgement at the time. We also do not have anything like full records of the number of deaths due to asbestos or the cost of removing it from places where it was used. Some partial data are, however, available and they give us an indication of the scale of the problem. For example, it has been estimated that between 1979 and 2001, over 200,000 people died in the USA from diseases caused by asbestos. It has also been estimated that there are about 250,000 mesothelioma deaths still to come in the EU even though asbestos is no longer used; this is because the disease takes so long to develop. The long time lag between first exposure and the actual onset of the illness is yet another argument in favour of a precautionary approach. As for the financial loss, the Dutch have estimated that if they had banned asbestos in 1965, when the mesothelioma evidence had been widely accepted, instead of in 1993, they would have saved about $20 billion in construction and compensation costs. That’s for one small country and assuming action was taken considerably later than a precautionary approach would have implied, so you can imagine what the total must be. Bovine somatotropin, commonly known as BST, is a growth hormone frequently given to cattle in the USA. The European Union prohibits the import of products from these cattle on health and safety grounds. In 1996, the United States appealed to the World Trade Organisation, claiming that the EU’s ban was an unfair restraint of trade. Let’s see how the precautionary principle operates. Are there good scientific grounds for concern? There certainly appear to be, because we always have to be cautious where hormones are involved. They are signal substances, telling the body to do something rather than doing it themselves, and that means they can have major effects even at very low dosages. And while BST normally acts in cattle, hormones are not necessarily species specific, which means BST might act in humans as well. When we look into the situation more closely, however, things look a bit better, at least initially. Most of the BST in milk is destroyed by pasteurisation. What’s more, any that survives can’t function as a growth hormone in humans because the molecule is the wrong shape and doesn’t bind to the appropriate receptors. On the other hand, BST stimulates the production of ‘insulin-like growth factors’ in cattle, and these are not destroyed by pasteurisation. In humans, high levels of IGF-1 are associated with a greater risk of cancer . At present, we don’t know whether it increases the risk or whether it is merely a marker for cancer risk – i.e. we don’t know if it is cause or effect – but it’s clearly something to be concerned about. There is also the problem that hormones often play more than one role. Even if we know their chief function we may have no idea what else they do. So the fact that BST can’t act as a growth hormone in humans doesn’t mean that it doesn’t act in humans at all. As in conventional risk assessment, we have to look at the other side as well. How great a risk we are willing to take naturally depends on the cost of not taking it. There is no shortage of milk in the EU; on the contrary, the EU has had to impose quotas to reduce milk production by its own farmers. Is BST a hazard to human health? We don’t know. We don’t even know how likely that is. But that’s precisely the point. If we were sure it was dangerous, there’d be no argument. It’s when we aren’t sure that the precautionary principle comes into play. Here it surely leads us to conclude that on the basis of the evidence currently available, the EU is justified in not permitting the import of milk from BST treated cattle. The WTO, however, generally applies the anti-precautionary principle. It therefore ruled that it was up to the EU to prove that BST is hazardous to human health and gave the EU a year to do this. Not surprisingly, the EU was not able to comply, largely because whatever harmful effects there are probably can’t be seen in such a short time, even if we knew exactly what we were looking for, which of course we don’t. After all, both asbestos and smoking can take 20 years or more to act, and here one of the chief concerns is the possible effect of ingesting small quantities of IGF-1 over a long period of time. In the end, the ban was allowed to stand, but only for the time being; the US is still trying to get it removed. I was recently arguing with a leading British opponent of the precautionary principle. I asked him several times, in different ways, if he thought the WTO was right to insist that the EU drop its ban on BST. He steadfastly refused to give me an answer, which I’m sure was because he agreed the WTO was wrong but didn’t want to admit that the precautionary principle can really work. Finally, he said that it didn’t matter whether we accepted the precautionary principle or not because the Americans had told him that whatever the WTO decided, they’d force BST products into the EU one way or another. That tells you where the opponents of the precautionary principle really stand. They’re not interested in the logic of the case. They just want to foist their products on us by whatever means they can. That is exactly what they are doing with GM crops. I’m not going to say much about GMOs because Mae Wan Ho will be dealing with them in some detail. As she’ll explain, there are many good reasons for being concerned about GMOs: it is an inherently hazardous technology, the risks of horizontal gene transmission, allergic effects, and so on . I’d like to comment on one further issue however, diversity. Here in the Philippines there are thousands of varieties of rice. If you were to switch to GM rice, there would be at most a handful. The biotech companies aren’t going to genetically modify large numbers of varieties, and there wouldn’t be time for local types to evolve, even if farmers were allowed to keep their seeds – which of course they are not. This could leave the Philippines highly vulnerable to any new pest or disease that might appear. Remember, GM crops have been engineered to be resistant to one particular challenge: a particular pest or a particular disease. They are at least as vulnerable to other pests and diseases as conventional crops, which makes relying on a single variety a very risky strategy. It’s worth bearing in mind that one of the reasons the famine in Ireland in the 19th century was so devastating was that the country was very heavily dependent on the potato, which is not indigenous to Ireland. It had been brought to Europe comparatively recently from Peru. With little or no diversity when the blight arrived, almost the entire crop was destroyed. The precautionary principle does not lead to the conclusion that we should stop all research into GMOs. If we think that genetic engineering has the potential to improve crops, and it may well have, then there’s no reason not to carry out research, providing we do it in enclosed laboratories and greenhouses. The objection is to releasing GMOs into the environment when there are so many unanswered questions concerning their safety and their effect on the environment in general and other crops in particular. We ought to be doing more research into understanding what happens in genetic engineering and finding better and safer ways of doing it, and of course devoting far more of our time, effort and resources to discovering how we can improve our farms and our crops without using GMOs (many examples in successive issues of Science in Society, especially #17, 23 and 28) [6-14]. In short, there’s nothing difficult about the precautionary principle. It’s just common sense. The only problem is getting our governments to accept that, and to act on it. COM (2000) 1 Communication from the commission on the precautionary principle. European Commission, Brussels, 2 February, 2000. See also M.W. Ho, Genetic Engineering, Dream or Nightmare? Gill & Macmillan, Dublin, 1999; or, by the same author, Living with the Fluid Genome ISIS and TWN, London and Penang, 2003. Ho MW. Zambia will feed herself from now on. Science in Society 2003, 17, 6-9. Lim LC, Ethiopia’s own agriculture. Science in Society 2003, 17, 7-8. Edwards S. Greening Ethiopia series. Science in Society 2004, 23, 4-8. Ho MW. One bird-ten thousand treasures. Science in Society 2004, 23, 17-18. Ho MW. Does SRI work? Science in Society 2004, 23, 14-16. Lim LC. Two rice better than one. Science in Society 2004, 23, 22. Ho MW. Organic farmer who values his freedom above all. Science in Society 2005, 28, 11-12. Ho MW. Brother Paul’s organic cotton and vegetable farm. Science in Society 2005, 28, 13-14. Ho MW. Organic yields on par with conventional & ahead during drought. Science in Society 2005, 28, 17-18. Decades of an “environmental bubble economy” built on the over-exploitation of natural resources has accelerated global warming, environmental degradation, depletion of water and oil, and falling crop yields, precipitating a crisis in world food security with no prospects for improvement under the business as usual scenario. Genetically modified crops promoted to “feed the world” have the worst features of industrial monocultures and are proving inherently hazardous to health. They are a dangerous diversion from the urgent task of getting our food system sustainable in order to really feed the world. Expanding the cultivation of GM crops across the world is a recipe for global biodevastation, massive crop failures and global famine. There is a wealth of knowledge for making our food system sustainable that not only can provide food security and health for all, but can also effectively mitigate global warming by preventing greenhouse gas emissions and creating new carbon stocks and sinks. One of the greatest obstacles to implementing the knowledge is the dominant economic model of unrestrained, unbalanced growth that has precipitated the present crisis. I describe a highly productive integrated farming system based on maximising internal input to illustrate a theory of sustainable organic growth as alternative to the dominant model. World grain yield fell for four successive years from 2000 to 2003 as temperatures soar, bringing reserves to the lowest in thirty years . A ‘bumper’ harvest in 2004 was just enough to satisfy world consumption. Experts are predicting  that global warming is set to do far worse damage to food production than “even the gloomiest of previous forecasts.” An international team of crop scientists from China, India, the Philippines and the United States had already reported that crop yields fall by 10 percent for each deg. C rise in night-time temperature during the growing season . The Intergovernment Panel on Climate Change (IPCC) predicted that the earth’s average temperature would rise by 1.4 to 5.8 deg. C within this century . But the IPCC model fails to capture the abrupt nature of climate change, which could be happening over a matter of decades or years . A group based in Oxford University in the UK is predicting a greater temperature rise of 1.9 to 11.5 deg. C when carbon dioxide level in the atmosphere, currently standing at 379 parts per million, doubles its pre-industrial level of 280 parts per million sometime within the present century . The “environmental bubble economy” built on the unsustainable exploitation of our natural resources is due for collapse  said Lester Brown of Earth Policy Institute. The task of turning our food production system sustainable must be addressed at “war-time” speed. In too many of the major food-production regions of the world, such as the bread baskets of China, India and the United States, conventional farming practices including heavy irrigation have severely depleted the underground water [7, 8]. At the same time, world oil production may have passed its peak , and cheap oil has certainly ended since oil price hit a record high of US$58 a barrel on 4 April 2005, and is expected to top US$100 within two years . This spells looming disaster for conventional industrial agriculture, which is heavily dependent on both oil and water; and genetically modified (GM) crops all the more so (see below). Our current food production system is a legacy of the high input agriculture of the green revolution, exacerbated and promoted by agricultural policies that benefit trans-national agribusiness corporations at the expense of farmers [11, 12]. Its true costs are becoming all too clear (see Box 1). So why won’t genetically modified (GM) crops offer the solution to the food crisis? A GMO or genetically modified organism is one whose natural genetic material has been modified by having synthetic genetic material inserted into it. That is how we have GM crops grown for food and feed, for fibre and for a range of pharmaceuticals and industrial products in the latest offering. Certain scientists have been going around saying that GM food is the answer to feeding the world, that it is perfectly safe because the technology is very precise and the regulation the strictest in the world; that GM is good for biodiversity, increases yield, reduces pesticide use, and so on. All of the claims have been falsified, with data collected by the US Department of Agriculture and by independent scientists . Farmers’ experience from all over the world are now finding that GM crops require more water and are less tolerant to drought than non-GM varieties . 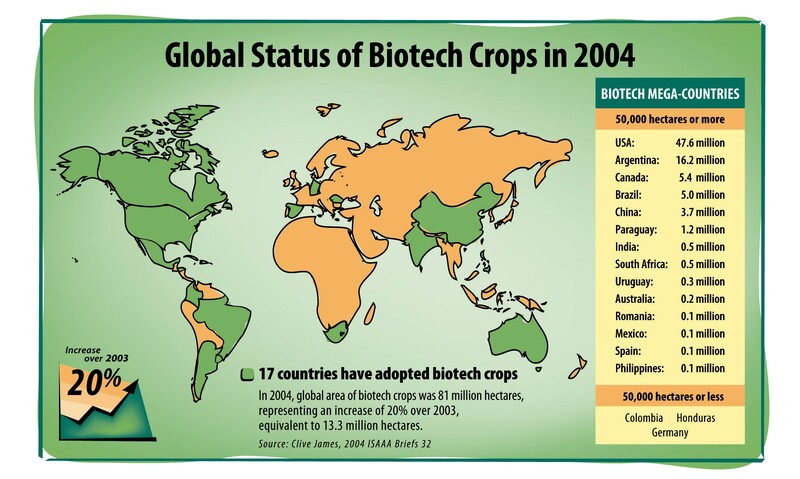 According to industry-backed International Service for the Acquisition of Agri-biotch Applications (ISAAA) - which describes itself as “a not-for-profit organization that delivers the benefits of new agricultural biotechnologies to the poor in developing countries” - GM crops covered 81 million hectares worldwide in 2004, an increase of 20 percent over 2003 . GM crops are industrial monocultures only far worse. Two traits account for nearly all GM crops planted: herbicide-tolerance (almost all glyphosate-tolerant) covering more than 75 percent of the area, and Bt – crops engineered with toxins from the soil bacterium Bacillus thuringiensis to kill insect pests - in the remaining area. Note that the actual area covered is only 1.6 percent of the world’s total agricultural land, and 80 percent are in two countries, so it is definitely not too late to say no. Evidence has been accumulating over the years that both types of GM crops have failed on every count : yield drag, poor performance in the field, more pesticides used, reduced profits for farmers (at times drastically so, causing poor farmers to commit suicide), and bad for health and the environment; so much so that I was ready to say goodbye to GMOs in 2002 . It was too optimistic, in the face of powerful corporate propaganda and disinformation. But a spate of recent findings not only confirms what we already know, but also completes the debacle. Roundup resistant superweeds  and Bt-resistant insect pests have now been documented , making both Roundup tolerant crops and Bt crops useless. The problems don’t end there. That’s not all. A research team led by Dr Irina Ermakova of the Russian Academy of Sciences has just reported that 36 percent of rats born to GM-soya fed mothers were severely stunted compared with 6 percent of rats born to mothers fed non GM-soya. Within three weeks, 55.6 percent of the progeny of GM-soya fed rats died; the death rate was six to eight times that of progeny from rats fed non-GM soya, or a diet without added soya . This latest is perhaps the most dramatic in a string of revelations indicating that GM food is far from safe, which have been systematically dismissed, suppressed or not followed up. New research in Canberra Australia demonstrated that a previously harmless protein in bean when transferred to pea caused inflammation in the lungs of mice and provoked reactions to other proteins in the feed . To cut a long story short, different species of GM food and feed with different genes had adversely affected several species of animals including human beings. You don’t have to be a scientific genius to see that there may be something in the genetic engineering process itself that’s harmful. The case of the transgenic pea is interesting, because certain immunological and biochemical studies carried out for the first time on a transgenic protein revealed that the protein is processed differently in the alien species, turning a previously harmless protein into a strong immunogen. In addition, the transgenic protein promoted immune reactions against multiple other proteins in the diet. As practically all the transgenic proteins involve gene transfer to an alien species, they will be subject to different processing, and are hence potentially immunogenic . Yet, none of the transgenic proteins commercially approved for food and feed had received the regimen of tests now carried out on the transgenic pea protein. This omission is a most serious public health issue; and warrants an immediate ban on GM food and feed until proper assessment on the immunogenicity of all the transgenic proteins has been carried out. So what’s wrong with GMOs? First, new genes and combinations of genes made in the laboratory, which have never existed in billions of years of evolution, are introduced into our food chain. All species process their proteins differently; therefore immune reactions including allergies are to be expected, as has now been demonstrated in the transgenic pea. But transgenic proteins also differ from the native proteins in amino acid sequences, some of which are intentional and others unintentional. If you just look at the amino acid sequences, 22 out of 33 transgenic proteins in GM crops already commercialised are found to have similarities to known allergens, and are therefore suspected allergens . The synthetic genetic material are introduced into the cells of organisms with invasive methods that are uncontrollable, unreliable and unpredictable, and far from precise. It ends up damaging the natural genetic material of the organism with many unpredictable, unintended effects, including gross abnormalities that you can see, and metabolic changes that may be toxic that you can’t see . Many foreign synthetic genes are copies of those from bacteria and viruses that cause diseases. They also contain antibiotic resistance marker genes to help track the movements of the foreign gene inserts and select for cells that have taken up the foreign genes. Right from the beginning of genetic engineering in the mid1970s, geneticists themselves have worried that releasing those synthetic genetic material runs the risk of creating new viruses and bacteria that cause diseases, and spreading antibiotic resistance to make infections untreatable . They even imposed a moratorium as the result of the Asilomar Declaration. Unfortunately, the moratorium was short-lived, as geneticists were in a hurry for commercial exploitation of genetic engineering. The dangers arise because the genetic material persists long after the cells or organism is dead, and can be taken up by bacteria and viruses that are in all environments. This process - called horizontal gene transfer and recombination - is the main route to creating dangerous pathogens. Genetic engineering is nothing if not greatly enhanced horizontal gene transfer and recombination, and nasty surprises have been sprung already. The researchers added a gene coding for an immune signalling molecule to the virus, which they thought would boost antibody production; instead, it suppressed immune responses. The researchers had previously put the same gene into a vaccinia virus and found it delayed the clearance of virus from the animals, so it may well have the same immune suppressive effects for all viruses. Imagine what would happen if this gene ever got into a smallpox virus! More surprisingly, researchers at the University of California in Berkeley found that disrupting a set of disease-causing genes in Mycobacterium tuberculosis, the tuberculosis bacterium, resulted in a hyper-virulent mutant strain that killed all the mice by 41 weeks, while all the control mice exposed to the unmodified bacterium survived . There is yet another insidious danger. The synthetic genes created for genetic modification are designed to cross species barriers and to jump into the natural genetic material of cells. Such constructs jumping into the natural genetic material of human cells can trigger cancer. This is not just a theoretical possibility. It has happened in gene therapy , which is genetic modification of human cells and use constructs very similar to those for genetic modification of plants and animals. In 2000, researchers in the Neckar Hospital in Paris, France, treated infants with X-linked Severe Combined Immune Deficiency apparently successfully by isolating bone marrow cells from the patients, genetically modifying them in the test tube, and then injecting the genetically modified cells back into the patients. But since 2002, 3 infants have developed leukaemia. One child has died. The foreign synthetic gene has inserted near a human gene that controls cell division, making it overactive, resulting in uncontrollable multiplication of the white blood cells. I have only scratched the surface of the problems and hazards of genetic modification. But you can already see that there has been a massive campaign of misinformation and disinformation on the part of the GM proponents. The greatest danger, I think, is the mindset of the GM proponents. Genetic engineering of plants and animals began in the mid 1970s under the illusion that the genetic material is constant and static and the characteristics of organisms are hardwired in their genes. One gene determines one characteristic. But geneticists soon discovered to their great surprise that the genetic material is dynamic and fluid, in that both the expression and structure of genes are constantly changing under the influence of the environment. By the early 1980s, geneticists have already coined the term, “the fluid genome”, to encapsulate this major paradigm change, as I describe in my book, Living with the Fluid Genome . The genome is the totality of all the genetic material in an organism. The processes responsible for the fluid genome are precisely orchestrated by the organism as a whole in a dance of life that’s necessary for survival. In contrast, genetic engineering in the lab is crude, imprecise and invasive. The rogue genes inserted into a genome to make a GMO can land anywhere in any form and has a tendency to be unstable, basically because these rogue genes do not know the language of the dance. Genetic engineers haven’t learned to dance with life. That is why dozens of prominent scientists from seven countries launched themselves as the Independent Science Panel, to overcome the campaign of disinformation from pro-GM scientists who are working to promote the corporate agenda, and to reclaim science for the public good. We compiled all the evidence against GM crops as well as the evidence on the successes and benefits of all forms of sustainable non-GM agriculture in a report, The Case for a GM-Free Sustainable World . Based on this evidence, we are calling for a ban on the environmental releases of GM crops and a comprehensive shift to sustainable agriculture. It is sheer lunacy to expand the cultivation of GM crops across the world, as the pro-GM lobby is pushing for. It can lead nowhere else but towards global biodevastation, massive crop failures and global famine. Getting our food production sustainable is the most urgent task for humanity; it is also the key to delivering health, mitigating global warming and saving the planet from destructive exploitation. The benefits of sustainable food systems are becoming evident (see Box 2). There are major opportunities to reduce energy use, to make our food system much more energy efficient, and even extract energy from agricultural wastes to replace fossil fuel, at the same time turning the wastes into rich fertilizers to increase productivity, reducing greenhouse gas emissions while increasing carbon stocks and sinks. There is a wealth of existing knowledge that could provide food security and health for all and significantly mitigate global warming . Unfortunately, our elected representatives are overwhelmingly committed to the neo-liberal economic model that created the bubble-economy in the first place. They lack the wisdom and the political will to make the structural and policy change required for implementing the knowledge. That is why the Institute of Science in Society (ISIS) and the Independent Science Panel (ISP) have launched a Sustainable World Initiative to create an opportunity for scientists across the disciplines to join forces with all sectors of civil society in a bid to make our food system sustainable . We aim to produce a comprehensive report at the end of the year that will lay out the existing knowledge base as well as the socioeconomic and political policy and structural changes needed to implement sustainable food systems for all. The launch conference took place in UK Parliament 14 July 2005 , and was a great success. The dominant economic model glorifies competitiveness and unlimited growth involving the most wanton and destructive exploitation of the earth’s natural resources that have laid waste to agricultural land and impoverished billions. A study for the International Food Policy Research Institute reveals that each year, 10 million hectares of cropland worldwide are abandoned due to soil erosion, and another 10 million hectares are critically damaged by salination as a result of irrigation and/or improper drainage methods. This amounts to more than 1.3 percent of the world’s total cropland; and replacing lost cropland accounts for 60% of the massive deforestation now taking place worldwide . Clearing forests releases their enormous carbon stocks to the atmosphere, turning important carbon stocks and sinks into sources. Some estimates have placed the total carbon stock of secondary tropical forests as high as 418 tonnes of C per hectare including soil organic carbon, and carbon is sequestered at 5 tonnes C per hectare per year . Deforestation accounts for 20 percent of the global total greenhouse gas emission , and is a major factor in destabilising climate and increasing the frequency of hurricanes, droughts, floods and heat waves. The neo-liberal economic model that rules the world has a lot to answer for. The World Health Organisation estimates that more than 3 billion people are malnourished (lacking calories, protein, iron, iodine and/or vitamins A, B, C, and D), and 850 million actually suffer from hunger (protein-energy malnutrition) . The principal cause of hunger is poverty. Some 1.08 billion in developing countries live on $1 or less a day; of these, 798 million are chronically hungry. Continued commitment to the dominant economic model – that has so glaringly failed the reality test - is perhaps the greatest obstacle to implementing sustainable food systems. There are already many success stories from the grassroots, and I shall describe one of them  briefly. It illustrates most concretely an alternative model of sustainable, balanced growth that I have been elaborating over the past 8 years in my book, The Rainbow and the Worm and elsewhere [76-79], and presented in its most definitive form recently in collaboration with ecologist Robert Ulanowicz . It may sound like a dream, but it is possible to produce a super-abundance of food with no fertilizers or pesticides and with little or no greenhouse gas emission. The key is to treat farm wastes properly to mine the rich nutrients that can be returned to the farm to support the production of fish, crops, livestock and more, get biogas energy as by-product, and most importantly, conserve and release pure potable water back to the aquifers. Professor George Chan has spent years perfecting the system; and refers to it as the Integrated Food and Waste Management System (IFWMS) . I just call it “dream farm” . Chan was born in Mauritius and educated at Imperial College, London University in the UK, specializing in environmental engineering. He was director of two important US federal programmes funded by the Environmental Protection Agency and the Department of Energy in the US Commonwealth of the Northern Mariana Islands of the North Pacific. On retiring, Chan spent 5 years in China among the Chinese peasants, and confessed he learned just as much there as he did in University. The integrated farm typically consists of crops, livestock and fishponds. But the nutrients from farm wastes often spill over into supporting extra production of algae, chickens, earthworms, silkworms, mushrooms, and other valuables that bring additional income and benefits to the farmers and the local communities. The secret is in treating wastes to minimize the loss of valuable nutrients that are used as feed. At the same time, greenhouse gases emitted from farm wastes are harvested for use as fuel. Livestock wastes are first digested anaerobically (in the absence of air) to harvest biogas (mainly methane, CH4). The partially digested wastes are then treated aerobically (in the presence of air) in shallow basins that support the growth of green algae. By means of photosynthesis, the algae produce all the oxygen needed to oxidise the wastes to make them safe for fish. This increases the fertilizer and feed value in the fishponds without robbing the fish of dissolved oxygen. All the extra nutrients go to increase productivity, which is standing carbon stock, preventing carbon dioxide going to the atmosphere. Biogas is used, in turn, as a clean energy source for cooking, electricity, lighting, etc. Cooking alone has been a great boon to women and children , above all, saving them from respiratory diseases caused by inhaling smoke from burning firewood and cattle dung. It also spares the women the arduous task of fetching 60 to 70 lb of firewood each week, creating spare time for studying in the evening or earning more income. Biogas energy also enables farmers to process their produce for preservation and added value, reducing spoilage and increasing the overall benefits. “It can turn all those existing disastrous farming systems, especially in the poorest countries into economically viable and ecologically balanced systems that not only alleviate but eradicate poverty.” Chan says . The ancient practice of combining livestock and crop had helped farmers almost all over the world. Livestock manure is used as fertilizer, and crop residues are fed back to the livestock. Chan points out, however, that most of the manure, when exposed to the atmosphere, lost up to half its nitrogen as ammonia and nitrogen oxides before they can be turned into stable nitrate that plants use as fertilizer. The more recent integration of fish with livestock and crop has helped to reduce this loss . Adding a second production cycle of fish and generating further nutrients from fish wastes has enhanced the integration process, and improved the livelihoods of many small farmers considerably. But too much untreated wastes dumped directly into the fishpond can rob the fish of oxygen, and end up killing the fish. Chan’s most significant innovation is thus the two-stage method of treating wastes. The anaerobic digestion prevents the loss of nutrients and substantially reduces greenhouse gas emissions in the form of both methane (harvested as biogas) and nitrous oxide (saved as nutrient) that go to feed algae and then fish. To close the circle, which is very important for sustainable growth, livestock should be fed crops and processing residues, not wastes from restaurants and slaughterhouses. The aerobic treatment in the shallow basins depends on oxygen produced by the green alga Chlorella. Chlorella is very prolific and can be harvested as a high-protein feed for chickens, ducks and geese. When the effluent from the Chlorella basins reaches the fishpond, little or no organic matter from the livestock waste will remain, and any residual organic matter will be instantly oxidized by some of the dissolved oxygen. The nutrients are now readily available for enhancing the prolific growth of different kinds of natural plankton that feed the polyculture of 5 to 6 species of compatible fish. No artificial feed is necessary, except locally grown grass for any herbivorous fish. The fish waste, naturally treated in the big pond, gives nutrients that are effectively used by crops growing in the pond water and on the dykes . Fermented rice or other grain, used for producing alcoholic beverages, or silkworms and their wastes, can also be added to the ponds as further nutrients, resulting in higher fish and crop productivity, provided the water quality is not affected. Trials are taking place with special diffusion pipes carrying compressed air from biogas-operated pumps to aerate the bottom part of the pond; to increase plankton and fish yields. Apart from growing vine-type crops on the edges of the pond and letting them climb on trellises over the dykes and over the water, some countries grow aquatic vegetables floating on the water surfaces in lakes and rivers. Others grow grains, fruits and flowers on bamboo or long-lasting polyurethane floats over nearly half the surface of the fishpond water without interfering with the polyculture in the pond itself. Such aquaponic cultures have increased the crop yields by using half of the millions of hectares of fishponds and lakes in China. All this is possible because of the excess nutrients created from the integrated farming systems. Hydroponic cultures of fruits and vegetables in a series of pipes. The final effluent from the hydroponic cultures is polished in earthen drains where plants such as Lemna, Azolla, Pistia and water hyacinth remove all traces of nutrients such as nitrate, phosphate and potassium before the purified water is released back into the aquifer. The sludge from the anaerobic digester, the algae, crop and processing residues are put into plastic bags, sterilized in steam produced by biogas energy, and then injected with spores for culturing high-priced mushrooms. The mushroom enzymes break down the ligno-cellulose to release the nutrients and enrich the residues, making them more digestible and more palatable for livestock. The remaining fibrous residues also can still be used for culturing earthworms, which provide special protein feed for chickens. The final residues, including the worm casting, are composted and used for conditioning and aerating the soil. There has been a widespread misconception that the only alternative to the dominant model of infinite, unsustainable growth is to have no growth at all. I have heard some critics refer to sustainable development as a contradiction in terms. Dream farm, however, is a marvellous demonstration that sustainable development is possible. It also shows that the carrying capacity of a piece of land is far from constant; instead it depends on the mode of production, on how the use of the land is organised. Productivity can vary three- to four-fold or more simply by maximising internal input, and in the process, creating more jobs, supporting more people. The argument for population control has been somewhat over-stated by Lester Brown [7, 8]. I like the idea of “human capital” to counter that argument, if only to restore a sense of balance that it isn’t population number as such, but the glaring inequality of consumption and dissipation by the few rich in the richest countries that’s responsible for the current crises. The way Cuba coped with the sudden absence of fossil fuel, fertilizer and pesticides by implementing organic agriculture across the nation is a case in point [86, 87]. There was no population crash; although there was indeed hardship for a while. It also released creative energies, which brought solutions and many accompanying ecological and social benefits. For the past 50 years, the world has opted overwhelmingly for an industrial food system that aspired to substitute machines and fossil fuel for human labour, towards agriculture without farmers. This has swept people off the land and into poverty and suicide. One of the most urgent tasks ahead is to re-integrate people into the ecosystem. Human labour is intelligent energy, applied precisely and with ingenuity, which is worth much more than appears from the bald accounting in Joules or any other energy unit. This is an important area for future research. Let me clarify my main message with a few diagrams. The dominant model of infinite unsustainable growth is represented in Figure 1. The system grows relentlessly, swallowing up the earth’s resources without end, laying waste to everything in its path, like a hurricane. There is no closed cycle to hold resources within, to build up stable organised social or ecological structures. In contrast, a sustainable system is like an organism [76-80], it closes the cycle to store as much as possible of the resources inside the system, and minimise waste (see Figure 2). Closing the cycle creates at the same time a stable, autonomous structure that is self-maintaining, self-renewing and self-sufficient. In many indigenous integrated farming systems, livestock is incorporated to close the circle (Figure 3), thereby minimizing external input, while maximising productivity and minimizing wastes exported to the environment. The elementary integrated farm supports three lifecycles within it, linked to one another; each lifecycle being autonomous and self-renewing. It has the potential to grow by incorporating yet more lifecycles (Figure 4). The more lifecycles incorporated within the system, the greater the productivity. That is why productivity and biodiversity always go together . Industrial monoculture, by contrast, is the least energy efficient in terms of output per unit of input , and less productive in absolute terms despite high external inputs, as documented in recent academic research . Actually the lifecycles are not so neatly separated, they are linked by many inputs and outputs, so a more accurate representation would look something like Figure 5 [77, 79, 80]. The key to sustainable development is a balanced growth that’s achieved by closing the overall production cycle, then using the surplus nutrients and energy to support increasingly more cycles of activities while maintaining internal balance and nested levels of autonomy, just like a developing organism [77, 78, 80]. The ‘waste’ from one production activity is resource for another, so productivity is maximised with the minimum of input, and little waste is exported into the environment. It is possible to have sustainable development after all; the alternative to the dominant model of unlimited, unsustainable growth is balanced growth. The same principles apply to ecosystems  and economic systems [78, 79] that are of necessity embedded in the ecosystem (Figure 6). Economics immediately brings to mind money. The circulation of money in real world economics is often equated with energy in living systems. I have argued however, that all money is not equal [78, 79]. The flow of money can be associated with exchanges of real value or it can be associated with sheer wastage and dissipation; in the former case, money is more like energy, in the latter case, it is pure entropy. Because the economic system depends ultimately on the flow of resources from the ecosystem, entropic costs can either be incurred in the economic system itself, or in the ecosystem, but the net result is the same. Thus, when the cost of valuable (non-renewable) ecosystem resources consumed or destroyed are not properly taken into account, the entropic burden falls on the ecosystem. But as the economic system is coupled to and dependent on input from the ecosystem, the entropic burden exported to the ecosystem will feedback on the economic system as diminished input, so the economic system becomes poorer in real terms. On the other hand, transaction in the financial or money market creates money that could be completely decoupled from real value, and is pure entropy produced within the economic system. This artificially increases purchasing power, leading to over-consumption of ecosystem resources. The unequal terms of trade, which continues to be imposed by the rich countries of the North on the poor countries of the South through the World Trade Organisation, is another important source of entropy. That too, artificially inflates the purchasing power of the North, resulting in yet more destructive exploitation of the earth’s ecosystem resources in the South. It is of interest that recent research in the New Economics Foundation shows how money spent with a local supplier is worth four times as much as money spent with non-local supplier , which bears out my analysis. It lends support to the idea of local currencies and the suggestion for linking energy with money directly . It also explains why growth in monetary terms not only fails to bring real benefits to the nation, but end up impoverishing it in real terms [91, 92]. Lester Brown argues  that the economy must be “restructured” at “wartime speed” by creating an “honest market” that “tells the ecological truth”. I have provided a sustainable growth model that shows why the dominant model fails, and why telling the ecological truth is so important. Peng S, Huang J, Sheehy JE, LazAa RC, Visperas RM, Zhong X, Centeno GS, Khush GS and Cassman KG, Rice yields decline with higher night temperatures from global warming. PNAS 2004, 101, 9971-5. Climate Change 2001: The Scientific Basis. Contributions of Working Group 1 to the Third Assessment Report of the Intergovernmental Panel on Climate Change, Intergovernment Panel on Climate Change, Cambridge University Press, New York, 2001. “Internet project forecasts global warming. Biggest-ever climate simulation warns temperatures may rise by 11oC.” Michael Hopkin, New@nature.com published online: 26 January 2005. Brown L. Plan B: Rescuing a Planet under Stress and a Civilization in Trouble, Earth Policy Institute, W.W. Norton & Company, New York, 2003. Brown L. Outgrowing the Earth, The Food Security Challenge in an Age of Falling Water Tables and Rising Temperatures, W.W. Norton & C., New York, 2004. Gala R. Agriculture without farmers. ISIS report, June 2005. Yield Response to Water, FAO, Rome, 1979, cited in Brown, 2003. Hall CAS, Cleveland CJ and Kaufmann R. Energy and Resource Quality, Wiley Interscience, New York, 1986. Empty Breadbasket? The Coming Challenge to America’s Food Supply and What We Can Do About It. The Cornucopia Project. Rodale Press, Emmaus, PA, 1981. Voeding, Milieu en budget, report by Milieucentraal and Nibud, Utrecht, 2001. Pirog R.. "Checking the Food Odometer: Comparing Food Miles for Local Versus Conventional Produce Sales in Iowa Institutions." Leopold Center for Sustainable Agriculture. July 2003. Caroline Lucas MEP "Stopping the Great Food Swap" (speech) based on background research and support provided by Andy Jones and Vicki Hird of Sustain: The alliance for better food and farming, and by Colin Hines, author of Localisation: A Global Manifesto, Earthscan 2000. Hines C, Lucas C and Shiva V. Local food, global solution. The Ecologist, vol 32 No 5 June 2002 p 38. Traavik, T. Lecture to Special Biosafety Genok and TWN Seminar, 22 February, Kuala Lumpur, and personal communication. Scottish Agricultural College, Edinburgh, CAB International, 2003. Prescott VE, Campbell PM, Moore A, Mattes J, Rothenbrg ME, Foster PS, Higgins TJV and Hogan SP. Transgenic expression of bean a-amylase inhibitor in peas results in altered structure and immunogenicity. J. Agric Food Chem. 2005, 53, 9023-30. Ho MW, Traavik T, Olscik R, Tappeser B, Howard V, von Weizsacker C and McGavin G. Gene technology and gene cology of infectious diseases. Microbial Ecology in Health and Disease 1998, 10, 33-59. “The genie is out”, Editorial, New Scientist 13 January 2001. Shimono N, Morici L, Casall N, Cantrell S, Sidders B, Ehrt S and Riley LW. Hypervirulent mutant of Mycobacterium tuberculosis resulting from disruption of the mce1 operon. PNAS 2003, 100, 15918-23. Ho MW. Gene therapy woes. Science in Society 2005, 26, 36. Lal R. Soil carbon sequestration impacts on global climate change and food security. Science 2004, 304, 1623-7. Lasco RD, Sales RF, Extrella R, Saplaco SR, Castillo ASA, Cruz RVO ad Pulhin FB. Carbon Stock Assessment of Two Agroforestry Systems in a Tropical Forest Reserve in the Philippines. The Philippine Agriculturist 2001, 84, 401-7. Edwards S. Greening Ethiopia series, Science in Society 2004, 23, 4-8. Delate K, and Cambardella, CA. Organic Production. Agroecosystem performance during transition to certified organic grain production. Agronomy Journal 2004, 96:1288-1298. “Report proves that organic farming is better for wildlife” Soil Association Press Release 7 October 2004. Worthington V. Nutrition quality of organic versus conventional fruits, vegetables and grains. The Journal of Alternative and Complementary Medicine 2001, 7, 161-73. Lim LC. Organics for health. Science in Society 2003, 19, 29. Heaton S. Organic farming, food quality and human health: A review of the evidence. Soil Association, Bristol 2001. Cummins J. Organic agriculture helps fight cancer. Science in Society 2003, 18, 18. Pretty J. Agri-Culture, Reconnecting People, Land and Nature, Earthscan, London, 2002. Boyde T. Cusgarne Organics local money flows. New Economics foundation and the Countryside Agency, London, 2001. Ho MW. On the nature of sustainable economic systems. World Futures 1997, 51, 199-221. Ho MW. The Rainbow and the Worm, The Physics of Organisms. 2nd (enlarged) ed. World Scientific, Singapore, 1998, reprinted 1999, 2001, 2003 (available online from ISIS website www.i-sis.org.uk). Ho MW. Are sustainable economic systems like organisms? In Koslowski, P. (Ed. ), Evolution, Development and Economics, Springer-Verlag, Berlin, 1998b. Ho MW. Genetic Engineering Dream or Nightmare? Final chapter, Third World Network, Gateway, Penang & Bath, 1998c; 2nd edition, Gill & Macmillan & Continuum, Dublin & New York, 1999. Ho MW. Biogas bonanza for Third World development. ISIS report (to appear). Integration of Aquaculture into Crop-Animal Systems in Asia, Agricultural Systems, 71pp127-146. Prein M. ICLARM contribution No. 1611, Elsevier Science Ltd., Amsterdam The Netherlands, 2001. Zhong GF, Wan ZQ, Wu HS. Land-Water Interactions of the Dike-Pond System. Presses Universitaires de Namur and Eco-Technologie de Eaux Continentales, Belgium, 1997. Skeffington MS. Coping with the sudden absence of fuel, fertilizers and pesticides. Plenary lecture. Food Security in an Energy-Scarce World, University College, Dublin, 23-25 June 2005. Wright J. Feeding the world with a more ecological agriculture: so what’s stopping us? (Learning from the Cuban experience). Sustainable world lecture.15 July 2005 London. Tilman D, Reich PB, Knops J, Wedin D, Mielke T and Lehman C. Diversity and productivity in a long-term grassland experiment. Science 2001, 294, 843-5. Darley J. Farm based alternative energy sources. Plenary lecture. Food Security in an Energy-Scarce World, University College, Dublin, 23-25 June 2005. Douthwaite R. The Growth Illusion: How Economic Growth Has Enriched the Few, Impoverished the Many and Endangered the Planet. Green Books, Dartington, 1999. Growth The Celtic Cancer, Festa Review number 2, The Foundation for the Economics of Sustainability, Dublin, 2004.